In my house, this is the soup everyone wants when craving comfort and/or nursing a cold; it has replaced the chicken-noodle soup of my youth. 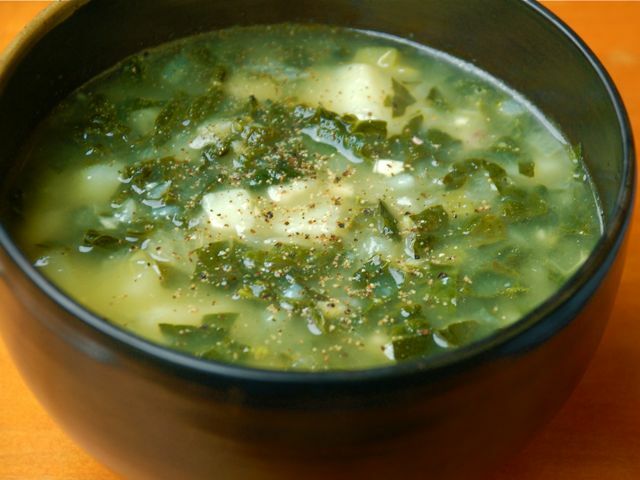 In Portugal the national soup, caldo verde, is a variation on potato soup with lots of greens and cured chorizo. Pour enough olive oil into a large soup pot to cover the bottom. Over medium heat cook the onion, garlic, and chile flakes for several minutes, until the onion begins to soften. Add the potatoes, broth, and bay leaf and bring to a boil. Add the kale, reduce heat to a simmer, and cook until the kale is tender and the potatoes are soft. Remove the bay leaf and season to taste with salt and freshly ground black pepper.